"What Tai Chi style do you do? ", is a question we're commonly asked. The short answer is "Yang style!" However, the long answer is a little more complicated. When you say Yang style you need to specify exactly which lines in the family tree that the style has come down through, as there are so many different versions of the Yang style of Tai Chi in existence today. Our lineage is rarer than most. This is the story of how our style has been passed down to us from the famous masters of the Ching Dynasty in China to the present day. We feel that the style of Tai Chi Chuan practiced and preserved by the Yongquan Martial Arts Association is a genuine marital arts treasure. It has come down to us today via an unbroken link from teacher to student and (by taking a sidestep through the backstreets of Hong Kong) has resisted many of the unfortunate trends towards simplification which so afflicted Tai Chi on the mainland under the oppressive Communist regime. Here we look at all the links in the chain which connect our practice to the famous masters of the past. Sifu Rand, Senior Instructor of the Yongquan Martial Arts Association, began training in the Chinese Martial Arts, specifically Tai Chi Chuan, Chi Kung, Shao Chao, Chin Na, Dim Mak and Choy Li Fut (Pak Sing) in January 1976, with Master Lam Kam Chuen in London. Prior to this he had three years experience in Ten Shin Shinyo Ryu (Jiu Jitsu) and some six months in Wing Chun. For more information on Sifu Rand we'd recommend his autobiographical article Beginnings. Sifu Rand was taught personally by Master Lam Kam Chuen for over 10 years before moving to Wales. Master Lam was born in Hong Kong just after the war in 1948 and began training at the age of 12. His teachers (amongst others) included Yim Sheung Mo and Lung Tse Cheung, who were students of the famous Ku Yu Chang in Hong Kong. Master Lam studied Yang style combat Tai Chi Chuan, Iron Palm, I Chuan, Choi Li Fut, Northern Shao Lin, Chi Kung, traditional Chinese weapons and much more. Master Lam was a martial arts instructor to the Royal Hong Kong Police and is qualified in Traditional Chinese Medicine, specialising in bone setting, herbalism and the use of Chi and Chi Kung to cure ailments. Master Lam came to England in 1975 and began teaching both privately and for the ILEA (thanks to the help of a Yoga teacher named Beryl Heed who became one of his first students). In 1977 he opened his first clinic in this country and began to practice as a Chinese doctor. Gradually a small group of private students developed and in 1982 Master Lam founded the Lam Tai Chi Association to help spread Tai Chi Chuan and related arts. Master Lam is an expert in Zhan Zhong (pronounced 'Jam Jong') Chi Kung and in 1995 made a 5 part documentary for Channel Four TV called Stand Still be Fit. Master Lam has published several books on Zhan Zhong Chi Kung, his own Short Form and Feng Shui, on which he is also a leading authority. Master Lam created the Lam Short Form, which along with the much shorter Yongquan form, is the main Tai Chi Chuan form taught within the Yongquan Tai Chi Chuan Association. We also teach the original long Yang form, from which the Lam Short Form was derived. While Master Lam was taught by both Lung Tse Chung and Yim Sheung Mo, Sifu Rand remembers it was Yim Sheung Mo who Master Lam talked about as being his primary teacher in Hong Kong when it came to Tai Chi Chuan. 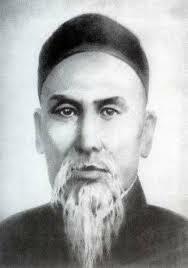 Yim Sheung Mo had many students, who have spread out all over the world and opened many Kung Fu schools of their own. One such student of Yim Sheung Mo is Master Chan Kwok Wai who moved to South America and set up a Kung Fu school there and currently heads the Academia Sino Brasileira de Kung Fu, in Sao Paulo Brazil. His students and their students have since opened their own schools, such as the Kai Men Association. Another student of Yim Sheung Mo is Sifu Wing Lam, who moved to San Francisco in 1976. Wong Jack Man, who had the famous San Francisco China town fight with Bruce Lee was another Northern Shaolin student from Hong Kong. Master Ku Yu Chang demonstrating his famous Iron Palm technique by breaking a stack of 12 bricks. Yim Sheung Mo learned Tai Chi Chuan from his teacher, Master Ku Yu Chang. 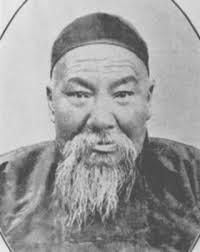 After the competition Ku Yu Chang was appointed as one of 'the Five Tigers of the North who went South', he, with the other four masters, were to open National Martial Art Schools and teach Chinese Martial Arts to the masses for the benefit of the Republic. One of the main objectives of Nationalist government during the 1920s was to unify China. It developed the motto: "A Strong Mind and a Strong Body builds a Strong Country". Part of their plan was to use martial arts to strengthen the populace. This resulted in the creation of Kou Shu, the precursor to modern day Wu Shu. For more information on this historical development see the article 'Disappearing weapons in Chinese Martial Arts' by Sifu Damon Smith on the Yongquan site. If you're interested, then much more extensive information on Ku Yu Chang is available here from the Kung Fu Online discussion forums. Ku Yu Chang studied and exchanged martial arts with and learned with many of his contemporaries, including learning Tai Chi Chuan from Sun Lu Tang, and this has often erroneously resulted in people confusing Ku Yu Chang's version of the Yang style of Tai Chi Chuan with the Sun style of Tai Chi Chuan (click here for an article written by Gene Ching, for an example of how this confusion has occurred in the past ). The confusion arrises because Master Chang learned two separate styles of Tai Chi Chuan - the Yang style from Li Jing Lin and the Sun style from Sun Lu Tang. These two styles look very different, and it's his Yang style that has been passed down to us through Yim Sheung Mo, Master Lam Kam Chuen and Sifu Raymond Rand. Master Ku Yu Chang is also the source of the Northern Shaolin Dragon Shape Sword form that we practice within our association. Ku Yu Chang wrote and published a book on his Yang style Tai Chi Chuan in 1936, "Tai Chi Boxing", which has been translated and is available free online from Brennan Translation. This valuable historical record contains pictures of Master Ku performing the form. At the Republican capital in Nanjing, Ku Yu Chang had the opportunity to expand his knowledge and skill from other kung fu teachers, including studying Hsing-I, Pa Kua and Tai Chi Chuan with Sun Lu Tang. He also had important exchanges with Tam Sam, one of the five Southern Tigers of the Choy Lee Fut style. They reportedly had a bout of which no one is certain of the victor. However, since the fight Tam Sam's lineage (Buk Sing Choy Li Fut) incorporated Northern Shaolin sets into their curriculum and vice versa, so the respect was mutual. In the end Ku Yu Cheung became a master of seven different Kung-Fu styles including: Beishaolin taught to him by Yin Kai Wun, Chaquan, taught to him by his father and Zhensheng, Hsing-I and Bagua, taught to him by Sun Lu Tang, as well as Tai Chi, Baji and Wudang Sword taught to him by Li Jinglin. 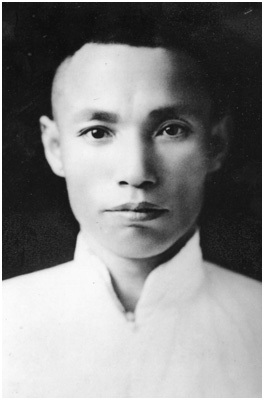 Ku Yu Chang learned his Yang style Tai Chi from Li Jin Ling (1885 - 1931), who was a General of the army of the Nationalist army of Chiang Kai-shek. General Li learned his Tai Chi from Yang Chien-Hou (Yang Lu-Chan's third son) but he was most known for his Wudang Sword skill. General Li Jing Lin was a very high ranking government official. Along with President General Chang Chih Chiang, he decided that the two most important styles of Chinese Martial Arts were Shaolin and Wudang and so these were the styles to be taught in the government schools by the Five Tigers. He was famous for his swordsmanship. He studied martial arts with Sun Lu Tang, and was a contemporary of Yang Cheng Fu, but learned his Tai Chi Chuan from Cheng Fu's father Yang Chien Hou. (Note: some schools have him as a student of Yang Ban Hou instead.) It is often speculated that his straight sword form was the one that was incorporated into the Yang family tradition as the Yang style straight sword form, rather than it being of Chen family origin. Unfortunately, the Wudang sword style he passed on is very rare these days. This is probably due to its reputed complexity. As an aside, here's a fascinating piece of historical video footage is the Yang form performed by Li Tianji (1913-1996), who was a student of Li Jing Lin, Sun Lu Tang and Yang Cheng Fu. To me it looks about halfway between the form of Li Jing Lin and Yang Cheng-Fu, since it contains many of the same movements as our form, but the angles have been changed to be less diagonal, and more straight line, like in the Yang Cheng-Fu form, and some of the more twisty movements have been simplified slightly, again also like Yang Cheng-Fu's form. 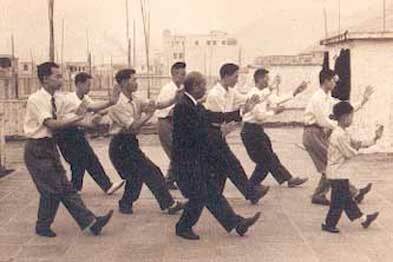 An interesting historical footnote is that Li Tianji created the first standardised simplified 24-Form Taijiquan and 32-Form simplified Taiji Sword in 1956. Some more information about Li Tianji can be found here. Li Jin Ling learned his Tai Chi Chuan from Yang Chien Hou, son of the famous Yang style founder, Yang Lu Chan, who learned his Tai Chi in Chen village. The story goes that Yang Chien Hou was the only person who could defeat Li Jing Ling with a sword, so he immediately asked to become his student. The third son of Yang Lu Chan, Yang Chien Hou (1839-1917) was credited with creating and practicing the 'middle frame' of the Yang style. His elder brother Yang Ban Hou practiced 'small frame' and had a much more aggressive temperament, thus keeping few students. 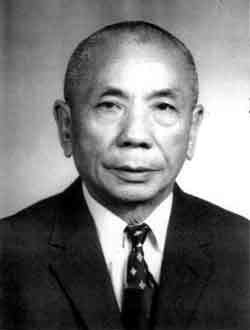 Yang Chien Hou was a more popular teacher, since he wasn't as harsh in his training methods as his brother, but compared to his son Yang Cheng Fu, who really popularised Tai Chi Chuan when he standardised the various different forms into one 'large frame', he still had very few students. There are various lineages descended from Yang Chien Hou (and Yang Ban Hou) and they all have forms that look different from each other, and from ours. The only conclusion I can come to is that the exact choreography of the form wasn't considered important during his lifetime, so students were taught on a more individual basis depending on what they needed to learn. Of course, forms surviving from the Yang Chien Hou lineage have all had to be passed on by more than one person to reach the current day, so it's only natural that they have been modified or altered by the people that passed them on as well. Since no photographic record of Yang Chien Hou's form exists we'll never know for sure. The origins of Tai Chi Chuan are to be found in the Chen village (Chenjiagou) in Henan province in China, but it was an outsider to the village, called Yang Lu Chan (1799-1872), who made it famous. Lu Chan, who became known as 'Yang the invincible', brought the art from rural obscurity into the public-eye in the 19th Century. Lu Chan had trained in the Chen village for a good number of years (estimates vary from between 9 - 40 years) before returning to his home in Yongnian, then moving to Beijing. In Beijing he came to the attention of the Emperor. He was reputed to have trained the Emperor's troops, which indicates the respect with which his art was held, and defeated all challengers earning his ‘invincible’ nickname. At this time Tai Chi Chuan, (then known as 'Long Boxing' or 'Cotton Fist'), was first and foremost a fighting art. By all accounts the martial aspects were retained by Yang Lu Chan's two sons (Yang Ban-Hou and Yang Chien-Hou) after his death.